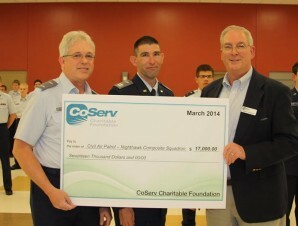 CORINTH, TEXAS – March 18, 2014 – The all-volunteer Nighthawk Composite Squadron of the Civil Air Patrol emphasizes aerospace education, cadet programs and emergency services. A $17,000 grant from the CoServ Charitable Foundation (CCF) will help the Denton nonprofit organization boost all three areas by funding technology upgrades that will create a mission-ready command center. In the grant application, Civil Air Patrol Maj. Steve Robertson, the squadron’s commander, said that information technology is the foundation for operational readiness and success. 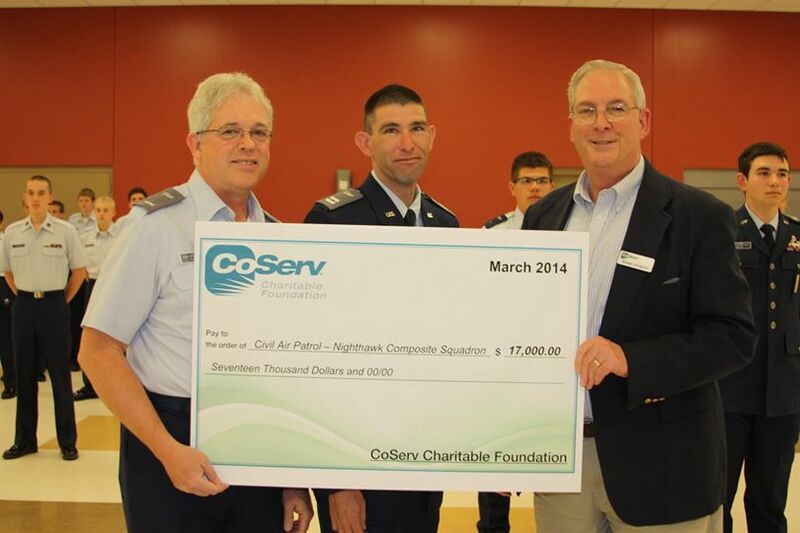 “These funds will help the squadron in life-saving missions in response to emergencies and disasters, in the training of adults and cadets in a variety of Civil Air Patrol tasks, and cadet instruction in cybersecurity,” he stated. With more than 100 members, the Nighthawk Composite Squadron, which serves as an auxiliary of the U.S. Air Force, is the largest composite (adults and cadets) in Texas. “Security and safety go hand in hand, and it’s good to know that these funds will help provide the hardware for more training and a quicker response to emergencies,” said CCF Executive Director Dennis Engelke, who presented the grant Monday, March 17, at the squadron’s regular weekly meeting at the U.S. Army Reserve Center in Denton.